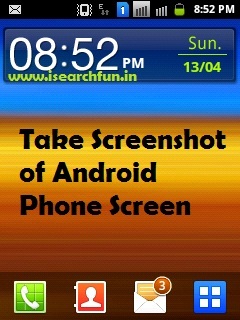 Have you ever tried to take a screenshot of your android phone`s screen? or Have you ever think about it? You know, Android has an option to take the screenshot of your phone screen at any point, either on Home screen, Menu Screen, Playing Music, During Call, Video playing etc, during any process. This feature is very beneficial for app developers to take snapshot of the different screens for their app as well android users can also take an advantage of it whenever they need. This feature is amazing. You need no other application to take a screen shot, Android devices comes up with this facility with some button combinations. All the images taken are using the screen capture functionality. The images taken will be saved into Gallery in ScreenCapture or Camshots name folder, depending on your device. The button combinations for screenshot are different for different android devices. It doesn't work the same for all versions of Android. The button combo might be either power button and home button , power button and back button, power button and volume up key, Home button and back button on different android phones. Mostly, The Power button and Home button works well on most of the devices. Switch to Screen which you want to capture. Press the Power button and press the center home button simultaneously. A image-shot audible sound made and a message appear on successful capture with frame. Your screenshot will be saved into Gallery. As I mentioned, the button combinations might differ depending on the devices. If this would not work on any device, Try with other button combinations. I tried some devices to confirm their button combinations. The Power and home buttons worked for some Android 2.3 devices ( Samsung Galaxy). The same combo worked fine with Android 4.0 ( HTC Desire ) devices. Some Android 4.0 devices use volume up and the power buttons to capture the screen. Also, Other simple way is just press and hold the power button from 1-2 seconds until you get a new menu screen appear. You then just need to select Take a Screenshot from the options to capture the screen. There are also some apps available in the android market which can be used to take a screenshot of the screen in your android phone. If the button combinations are working fine, then there should be no need of apps. But if some devices haven`t include this functionality, you can use apps for the same. Don`t forget to comment, If you find any other button combinations working for your android phone. WOW!!!!!! Thanku. i never think this.